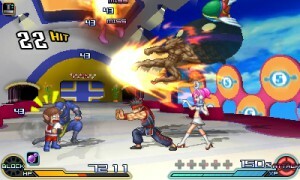 Even though the first Project X Zone is only roughly three years old, mingling different brands and franchises is something which CAPCOM has been doing for a long time, especially when it comes to its fighting games (CAPCOM vs. SNK, Street Fighter X Tekken, Marvel vs. CAPCOM, …). 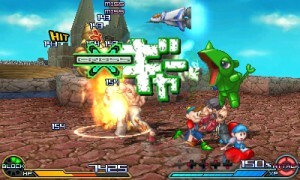 Nonetheless there have also been some other RPG-like games in the past that mixed different brands like Namco x CAPCOM and Cross Edge and it’s easy to say that Project X Zone was initially created with Namco x CAPCOM in mind. Once again we get to dive into an out-of-this-world battle between the franchises of three different publishers, where unseen alliances will have to be formed to abolish the evil from a united front of villains. Forget all you know about the principles of time and space and enjoy all the familiar faces crammed into one game. The story of Project X Zone 2 can be portrayed in a rather simple fashion, even if things seem to be overly confusing, especially if you’re not up to speed with all the franchises and their respective characters thrown into the whirlpool that makes this game original. Simply put, the world has gone through a nasty event, or rather nearly all worlds have gone through one grim event, namely evil had combined through portals that connected many different worlds, planets and even digital universes and due to this, all of the good forces of those worlds had to work together to vanquish darkness and restore everything as it once was. Several years have passed, at least in some worlds, but all of a sudden giant golden chains are appearing out of thin air, and yet again wormholes are sighted, which link different worlds and dimensions to one another. While Shinra, the organization that occupies itself with these events, was a key played in the previous ‘war’, it seems this one will take up even bigger proportions and help is certainly welcome. You’ll soon find yourself cooperating with the BSAA (Resident Evil), the Maverick Hunters (Mega Man) and many others to restore balance once again, and above all, get everyone back home. While the game is very story driven, it’s advisable to look up on certain franchises and if things aren’t clear right off the bat, it’s best to go with the flow as things will certainly get a lot more clear the further you progress. The overall experience is brought by witty conversations, with a lot of sexual references, albeit well within the PG friendly zone. 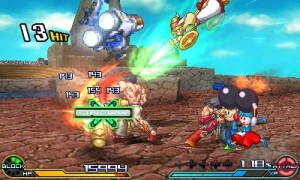 Graphically Project X Zone 2 combines 2D and 3D elements, creating a perfect harmony on screen. While the characters and enemies are always portrayed in a 2D fashion, they are very detailed during conversations and certain battle animations, while their actual counterparts during battles or on the map look a bit more like ‘chibi’ versions of themselves. The maps you find yourself on are presented with 3D clutter and buildings, yet the two styles flow in each other perfectly. 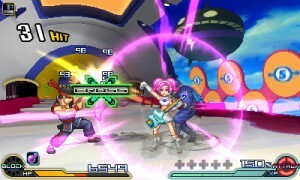 Project X Zone 2 is also one of those few games that actually look amazing when you turn on the 3D function of your 3DS, especially during combat. 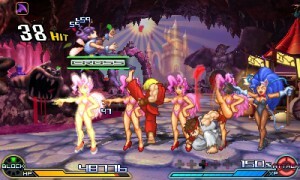 You’ll neatly see the different layers and especially when you activate a special move, things simply look astonishing. The game is crammed full with rather upbeat music and seeing you’ll find yourself in battles most of the time, this surely helps you get into the mood. Except for the track that runs during the intermission between chapters, there are enough songs for you to enjoy during your many battles to come. 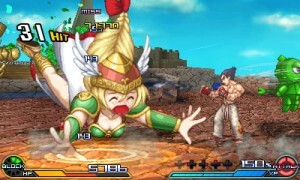 While many will cheep upon the fact that Project X Zone 2 comes with the original Japanese voice acting, it’s also sad that there is no option for English voice acting, especially seeing some franchises, such as Resident Evil, were never truly presented with Japanese voice acting overseas, thus those voices seem a bit strange and off. Same can be said about some franchises that never received English voices either, thus searching for proper voice actors for a decent amount of characters, while staying true to the source material would have been rather difficult as well. Perhaps a mix would have been the solution, but that’s simply our personal opinion. That being said, the voices are qualitative, quirky and amusing, as there is an emphasis on humoristic dialogues, with the necessary overacting in place. Project X Zone 2 is classified as a tactical RPG, while there is no real free movement in the game, outside of the battles that is. You’ll go from story to battle over and over again, and while this might not sound like much, it’s actually very pleasant, as you’re pretty much strapped in for an action packed ride from start to finish, while familiar characters are thrown at you constantly, making everything very likeable. After you’re done scrolling through the story section of the chapter you’re in, the battle will commence and actually things are as simple as they can get from then on. Your units will always team up in fixed pairs, with the option of adding a support unit as you progress further through the game. These pairs will show as one unit on the map, and when selected you will be able to move and attack, use skills, items or just go pacifist and pass up on your turn. If you decide to move, or attack, you’ll notice that a grid surrounds your character(s), showing how far you can move, or what your actual attack range is. 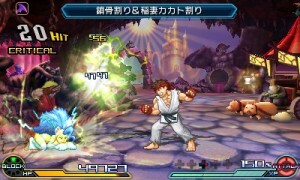 When you actually enter combat, the game will shift to a 2D perspective, reminiscent of the many fighting games all three brands combined have produced over the years, albeit their old school counterparts. During this battle phase you’ll be able to perform three moves with your duo, one move with your support unit and if another pair is standing next to you, they will also be able to grant you an extra attack. As this game works with a special XP bar, which gets filled during combat, you can also perform a special attack when this bar is at a 100% or higher. Your enemy can block during combat, at least at the beginning, and counter afterwards, if he has enough in his SP bar to do so. Of course your enemies, who are plentiful, can do the same as you, and they will do their best to put you six feet under. Nonetheless, you’ll have a set amount of actions you can undertake against their attacks, ranging from counters (50 SP), defending a fixed amount of damage (30 SP) and going for a block which nullifies your foe’s attack (50% XP). Most of these actions are straightforward, but the counter option is actually rather interesting, as it grants you not only a bit of damage in return, but a full-fledged counter attack, which is the same as a normal attack, granting you the same support or special move options. After each rather short chapter, there will be an intermission where you can save (there’s also a quicksave during normal gameplay), customize your characters when it comes to gear, skills and party formation, shop till you drop and train a bit on the side. While the latter will not grant you any additional experience, it’s great to try out party formations with different support units, making you create the ideal combinations, which grants you more damage or longer hit combos. 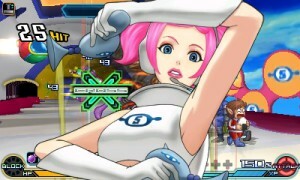 Even though Projext X Zone 2 offers you little to no freedom when it comes to exploring the world around you, the game proves to be action packed enough for you to be content nonetheless. You’ll still get to mess around with several party lineups and a bit of gear, even though adding equipment doesn’t offer any physical changes. Project X Zone 2 is a great story driven tactical RPG, that does an amazing job at combining heaps of different franchises into one single game. While the overall freedom might be on the low side, the atmosphere and mechanics prove to be of sublime quality. If you’re looking for a humor and action packed game, with stars from many of your favorite games and series, this one is certainly worth looking into.